The Cathedral provides stimuli and study points for undergraduates of many disciplines. Students of art, architecture and the creative and cultural industries may be inspired by the work of far sighted architects and artists in concrete, glass, metal, textiles. The unique space of the Cathedral reflects the spirit of the Second Vatican Council (1962-1965) and a papal desire to ‘open the windows (of the Church) and let in some fresh air’. It has captivated choreographers, musicians and most recently light artists to acclaim the power of the spirit alive in the building. Research into the symbolism embodied within the structure, fabric and function of the Cathedral generates a meaningful context for the student of religious and cultural education. The social and economic historian may be engaged by examination of the story of the people who envisioned and made real a Catholic Cathedral for Liverpool. The education team has expertise within and across subject disciplines and are skilled in facilitating visits from any group. Their combined experience of teaching across the age phases, from nursery to university, make them excellent consultants for teachers from all levels of education. The Education Team have a multiplicity of ideas for the Cathedral as a primary location for ‘Learning outside the Classroom’ and trainee teachers would benefit from the opportunity to engage with these as a precursor to generating their own approach and planning a visit for their school. During past visits, we have been able to arrange for a question and answer session to be held in the Gibberd Room. Depending on the topic you are interested in we can probably find appropriate staff to cover this aspect of the visit. We are always happy to put together a bespoke visit for your group. For students studying topics such as Journalism, Architecture and Town Planning, we are able to arrange a look around the Cathedral followed by an opportunity to discuss the work of the Archivist Neil Sayer. 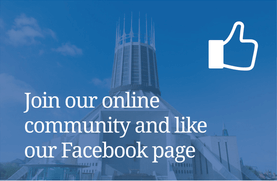 The Cathedral Archives offer a fascinating window on the life and times of the Metropolitan Cathedral, its parish, and the wider community in which we serve. The use of the Gibberd Room costs £10 and visits to the Lutyens Crypt are charged at £2 per person.